A beach hut is a small or of medium size, always wooden and often brightly coloured, housing unit above the high tide mark on popular bathing beaches. Beach huts are generally used as a shelter from the sun or wind, changing into and out of swimming costumes and for the safe storing of some personal belongings. Some beach huts provide simple facilities for beach lovers such as facilities for preparing food and hot drinks by either bottled gas or occasionally mains electricity. Beach huts in Goa are generally very down to the earth and basic beach accomodation provided by the many beach entrepreneurs on the coastline of Goa. Most of the beach huts in Goa are temporary accomodations provided bang on the beach or just a few hundred meters away from the high tide line. 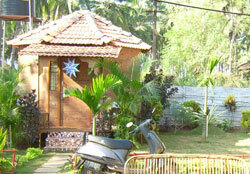 Goa beach huts are traditional, economical to stay in and mostly made from natural and perishable materials. Some of the newer beach huts provide ceramic flooring, basic pantry facilities and wooden beds to unwind in. Most of the beach huts are small in size comfortable enough for a couple. Having windows and thatched roof or mangalore tiled roof. The walls can be of wooden or some natural material. Main advantage of all beach huts are their close proximity to the wonderful beaches they are located on. Not a single 5 star hotel too can give you an experience of staying on the beach with the sand below your feet and the stars above your head. If a beach bum is what you are then there can be nothing better than a beach hut, as you can have your breakfast, lunch, wining and dining besides the sea. Staying in a hut is the closest way to live in the middle of nature. Hear the waves crashing on the beach as it makes music to your ears. Watch spectacular sunsets everyday from your cozy beach hut. Feel the sand on your feet daily. Beach huts are always close to the shore line, so one can have as many dips in the ocean as one pleases. Nature's swimming pool is never far away from any beach hut. 5. Full body sun tanning. Always wanted to have a single colored tan on your wonderful body from the head to the toe, then beach huts have ample of private & secluded areas close to the beach where you can suntan your glorious body to a great tan. Sun tanning can be at your beach hut or just a walk away right on the beach. Goa is the only place in India, where one gets a widest range of local restaurants called shacks right on the beach. Built on wooden stilts or straigth on the beach, these food joints are refreshingly different from the normal restaurant fare. 7. Beach Hut always economical. Accomodation prices when compared to any other form of holiday accomodation, beach huts are the lowest, cheapest and the best when compared to the value of accomodation they provide to the beach lover. Staying in a beach hut is a down to the earth experience and at the same time is exhilerating for romantic lovers. Couples find it very exciting to live, love and spend quality time together in the simplest & modest accomodation that a beach hut can offer. Many rich and successful people love to live in beach huts, for the simple way of living. After living in luxurious lifestyles with lots of stress coming along with it, many people are advised to take a break and enjoy a holiday the simple way, the beach hut way. A beach hut being basic with minimal luxuries helps people to connect with nature and the simple things in life. So living in a beach hut is spiritual too.